Despite being a major player in the van conversions market, Globecar has the focus of a small converter: it builds just one type of motorhome, which has allowed it to perfect its offering over the years. Indeed, many widely seen van conversion innovations had their origin in Globecar’s design studio. Based in southern Germany, the brand is a veritable super-producer, with 5100 units carrying the badges of Globecar and sister brand Pössl rolling off the line in 2016. The portfolio sports two distinct vehicle types: D Line (high-tops; 11 models) and H Line (vans with raised roof sections; six models). Six Globecar dealers are based in Britain, including SMC in Newark, which acts as the brand’s UK agent. The Campscout Revolution is one of four 6.36m-long models in the D Line range. It’s based on the Fiat Ducato and offers two rear berths as standard, arranged as a longitudinal double (sibling ’van Campscout has fixed twin single beds). Although supplied in right-hand-drive, the side sliding door is on the UK offside and the conversion follows the Continental configuration. Our test ’van was supplied in Profondo Red Metallic, certainly a striking colour, with the optional ‘Square’ soft furnishings and ‘Elegance’ cabinetwork. Colour coded bumpers (a cost option) and moulded wheel arch trims and side skirts add style and practicality, combining well with the gloss-black of the radiator trim. 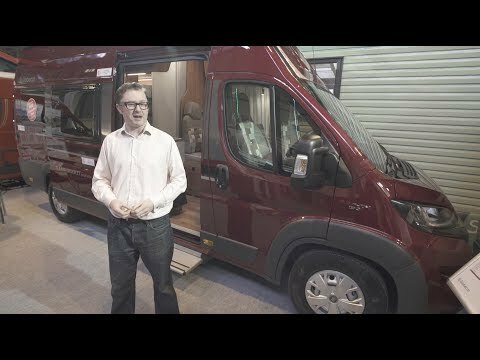 For 2017, the Campscout Revolution gets the latest Fiat Ducato engine, engineered to meet the Euro 6 emissions standard. Safety features ESP, ASR and hill hold come as standard, but our test ’van was also fitted with the optional All-In Package (£1595), which includes cab air-con, a passenger airbag, electrically adjustable mirrors, and cab seat coverings that match the habitation soft furnishings. The Fiat Ducato offers a commanding driving position, precise steering and assured handling, but drivers new to this vehicle will have to be wary of the pronounced A-pillars when approaching junctions. Two further travel seats are provided behind the cab. Lounge space in the Globecar Campscout Revolution centres on the forward-facing travel seats, partnering with swivelling cab chairs to provide four seating places. The lounge table hooks onto a rail under the nearside window, and has a sliding section to service the driver’s seat. Plenty of light can enter through both side windows and from a wind-up rooflight. A basic side kitchen is sited just inside the sliding door. Two gas burners sit alongside a square sink in a unit that also contains two wide drawers and a narrower one for cutlery. No oven is fitted, but one popular workaround for this is taking a Remoska electric mini-oven on tour. Food preparation space is limited, but a worktop extension flap and the lounge table provide options for expansion. As standard, the Campscout Revolution opts for an electrically operated longitudinal drop-down double bed that measures 1.93 x 1.9m. An additional double bed measuring 1.8 x 1.6m for the rear storage area is available as a £573 cost option; this packs away when not in use. But another sleeping position is also available in the dinette, if buyers specify the ‘cross bed’ (£286), which will take the berths count to six. It’s most suitable for two children. Globecar’s ‘through washroom’ is a clever use of limited space. There’s a swivelling toilet and sink, the tap of which doubles as the shower head. A mirrored cupboard sits above a side window, and a wooden inlay protects the shower tray from feet passing through. The large rear storage area, accessed via almost-flush-opening barn doors, makes this model the obvious pick for active motorcaravanners who tour with lots of outdoor kit. In addition, there are overhead lockers in the bedroom and lounge, and cupboard space in the under-bed wooden units. Fresh from the factory, the Globecar Campscout Revolution comes with that drop-down bed, a bulkhead partition for the rear storage area, a lounge rooflight and cassette blinds in the living area. Buyers can upgrade the spec from a respectable list of options, but the UK Package bundles many popular extras together. For £1231, you get a painted front bumper, cruise control, wheel trims, radio fittings and dual-fuel Truma Combi 4 space and water heating. Ideal for buyers looking to fill up the rear with outdoors kit, the Globecar Campscout Revolution packs a lot in by using its 6.36m body length very wisely. Build quality is impressive, and because you can add up to four extra berths, this flexible ’van can adapt to the changing needs of its users.